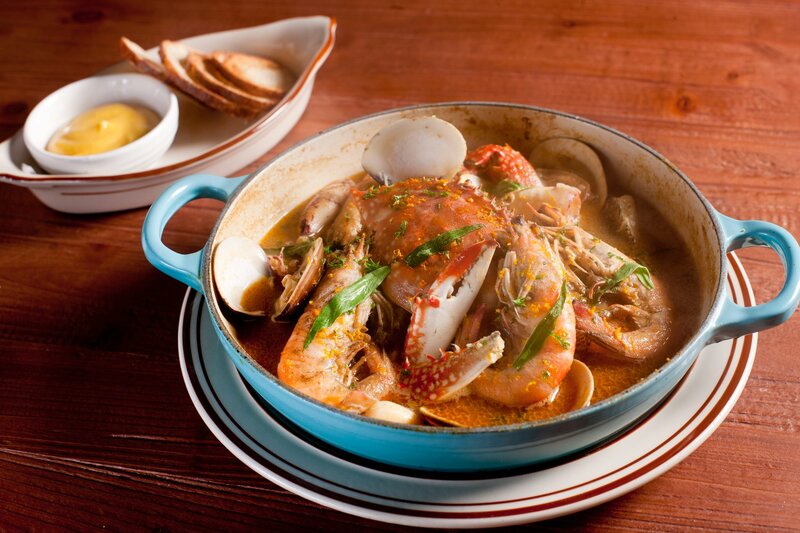 Who hasn’t had that craving for a delicious seafood Bouillabaisse or a succulent Coq au Vin? Hong Kong has some delicieux French-dining establishments, but sometimes we just don’t want to break the bank just for the opportunity to dine on crisp, white tablecloths, imbibe four to five-figure bottles of wine and savour French culinary creations. As the French say, ‘Ce n’était pas un problème!’ We have you covered with our guide to the best affordable French restaurants around Hong Kong. Nestled in hip and quaint Kennedy Town, Bistro du Vin has been a convivial addition to the up-and-coming neighborhood. We love Bistro du Vin’s rustic French décor, replete with bare wooden furniture, art-deco-inspired tiled flooring and diffused lighting. What’s more, its intimate setting (around 20 tables), makes it just private enough to for a romantic dinner for two or a private gathering for four. The starters and mains at Bistro du Vin are reminiscent of French, homey classics. Must-try Starters include Escargots in Shell, Garlic Herb Butter, which include juicy pieces of succulent escargot sitting atop a fatty, melting piece of bone marrow, and Cheesy Onion Soup – an oozy, creamy soup infused with sage butter. Our favourites mains include their signature Coq au Vin – garlic and Burgundy wine-infused goodness! All in all, Bistro du Vin is the place for delicious French classics reminiscent of the best of France. Even better? You can dine there for less than the cost of a night of boozing it up in TST! Located in peaceful Taikoo Shing, Eiffel Bistro is quickly positioning itself as the place for either an upscale business lunch or a more chill family soirée. We love Eiffel’s Parisian-style bistro, open kitchen, and wide, people-watching windows and artwork, inspired by the iconic Eiffel tower. Located in bustling Wan Chai, le Relais de l’Entrecote is the place for authentic French bistro flavours, crunchy home-made fries and tangy, signature ‘secret’ sauce that has all of Hong Kong talking. We love how le Relais uses only the freshest, and highest quality ingredients, imported directly from France. Le Relais’ affordably priced set lunch menu is the gem that keeps on giving. Their ‘light lunch’ menu starts at only $168 and comes with a Green Salad with Walnuts and le Relais’ signature Steak & French Fries drizzled with a unique sauce. Le Relais’ Steak et Frites is to die for! The crunchy, yet light, sizzling duck fat potato wedges coupled with a juicy French sirloin seared to perfection showcases the best of French cooking. If you have a sweet tooth, then be sure to try out le Relais’ tender, rich, and creamy vanilla bean-infused Crème Brûlée (!). If you’re on the east side of the Island, head over to le Relais de l’Entrecote for the best of what France has on offer at an affordable price. Head over to Bistronomique’s Kennedy Town outpost for great flavours and striking minimalism. With its high ceilings, Bistronomique’s dining room decor touts Scandinavian chic meets country rustic. We love the warm cream tones , providing a soothing ambiance overall. Tables are a bit too close for our liking, but hey, what’s not to like in being close to your fellow comrades? Maybe you can try a bit of their Roasted Goose if you ask nicely. Led by local chef David Lai, Bistronomique combines the best of local Hong Kong flavour with the techniques and culinary concoctions of the kitchens of illustrious restaurants such as Alain Ducasse’s Le Louis XV in Monaco. Don’t miss out on Bistronomique’s delicious Kurobuta Pork Belly and Roasted Goose, a tender and juicy bird, sizzled alongside crunchy, oven-cooked chestnut, sage-infused pumpkin and spinach. For those looking to pinch a penny (or two), check out their fall-off-the-bone Slow-Cooked Australian Lamb Shank: priced at a reasonable $258. All in all, Bistronomique is the place for an affordable yet elegant evening with with your loved one! If you’re in the mood for some of the French tastes you enjoyed at Chez Patrick Restaurant, then visit Chez Patrick Deli and you’ll find the same fresh, hand-plucked ingredients found in Chez Patrick’s food, but for less! Most of the products and ingredients found here are as fresh as those found in its sister restaurant, and you’ll find a bunch of homey bistro menu items including home-smoked salmons, freshly baked breads and homemade pates and jams. We love the Crab and Avocado Tartar – delicious, hand-plucked crab married with zesty avocado – and the Green Asparagus Soup: salty and savoury, oven-roasted asparagus paired with shallots, onions. We’re also mildly obsessed their Organic Wholewheat Seafood Liguini – jet-fresh squid, clams and scallops married with white wine sauce and fresh tomato, oh my! – and Chicken Basquaise (roasted chicken leg with seared Espelette peppers). Even though we know that The Continental isn’t a pure play French restaurant, we love the restaurant’s contemporary design, inspired by Europe’s grand cafés. The best way to describe The Continental is French elegance meets British gastronomy. What’s more, their Valentine’s Day Set Menu is sure one not to miss. We can’t get enough of their Butter Poached Alaskan Halibut & Caviar, featuring crushed russet potatoes, with tangy lemon butter and luxurious bits of caviar. Don’t miss out their seared Rangers Valley ‘Black Market’ Rib Cap Steak garnished with bits of crunchy cauliflower and black truffle. Finish the night off with a delectable Strawberry Tart, and Champagne Coulis – a freshly-baked tart mixed with succulent, just-picked strawberries. This set menu is definitely one that’s worth breaking any diet for! Two-Michelin starred chef Joël Robouchon is famous for his LE JARDIN and L’ATELIER dining concepts, offering the best of French classics amidst a contemporary fine-dining experience. If shelling out four to five-figures for lunch ain’t your thing, head over to LE CAFÉ de Joël Robouchon, and savour Michelin-starred culinary delights at half the price! Neatly ensconced amongst the litany of Harbour City shops with the likes of French staples such as Maison Margiela and Chloé sits Robouchon’s affordable offshoot, LE CAFÉ. We love the Mixed Mushroom ‘velouté’ with Black Truffle and their sumptuous Hokkaido Kegani Snow Crab Salad with Avocado off their starters menu. Mains worth pecking at include Crispy Duck Confit with Fresh Figs and Cabbage as well as Iberico Pork with Mashed Potato and Classic Charcutiere Sauce. Sure, having dinner whilst hearing hordes of shoppers vying for the next GUCCI sale sure ain’t romantic, but LE CAFÉ offers high-quality timeless French classics at an unbeatable price. Savvy Saver Tip: If you’re in a hurry, head to LE CAFÉ’s express counter and grab one of their baguettes, shipped daily from Paris. Named after four childhood friends who decided to bring back the good old recipes they enjoyed so much during their childhood, Les Fils à Maman serves up simple homemade classics their French mothers used to cook them everyday. We love the Obelix & Asterix references, and the adorable childhood pictures of the co-founders of the restaurant, found in Les Fils’ rustic menu. It’s certainly something unique, and different vis-à-vis other restaurants that we had the pleasure of visiting. We love the outrageous value found within Les Fils’ lunch menu, including dishes such as Fried Spices Babybel Croquettes, Raw & Smoked Salmon Rilletes as well as Fish of the Day and Seasonal Pot. What’s more, most French degustations at Les Fils are under $200! As an added bonus, we dig their tastefully designed interior; it’s reminiscent of the rustic chateaus off in France’s Burgundy region and costs waaaay less than a plane ticket to France. The instant that you walk into Cocotte you’re reminded of that chic Parisien home with plush velvet chairs and eye-catching wallpaper. Standouts at Cocotte include the juicy Steak Tartare, and delicious Crab Cake as well as the perfectly-seared, oh-so-tender Wagyu Beef Bravette Steak. Cocotte’s Discovery Menu is certainly worth perusing, especially their Truffle Risotto, which features truffle shavings and parmesan married with delicious pasta. Don’t miss out on the Grilled Beef Mignon, a juicy, chargrilled cut mixed with freshly cut and perfectly salted homemade fries. Oooh la la indeed.